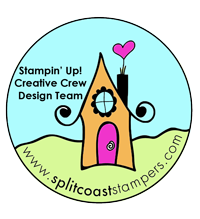 This is one of those unusual times when I’m glad to admit that “I was tempted!” What I mean is that I was tempted to join in the CAS Challenge over at Splitcoaststampers. The CAS469 challenge was to use a background stamp as the basis for a clean ‘n simple (CAS) card … certainly easy enough, and it’s literally been ages since I’ve inked up a full-sized background stamp. How about you? Another admission: I rarely make one-layer cards unless timing requires it, or other special circumstances. Truthfully, this just has the background stamped on Whisper White card stock, layered atop a mat of Basic Black, then applied to the jazzy Lemon Lime Twist card base. The horizontal layout allows space for the single strip of Black ‘n White ribbon from the 2017 Holiday Catalog. Tex’s Tip: Alignment of the ‘hugs’ die from the Lovely Words framelits is easiest by first die cutting the solid circle (Layering Circles framelits). Then, set the word die within the cut-out circle, eyeing the margins around the edges. Washi tape to my rescue here! *Setting dies in position before cutting is my favored time for using washi tape. Had to play in the latest Global Design Project challenge , GDP012, to ‘case the designer’! The designer to case? The one + only Brian King! 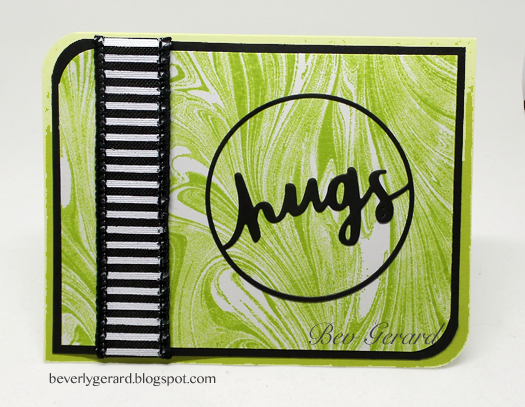 We could use Brian’s card to inspire color, theme, style, stamps … however the card inspires each stamper. 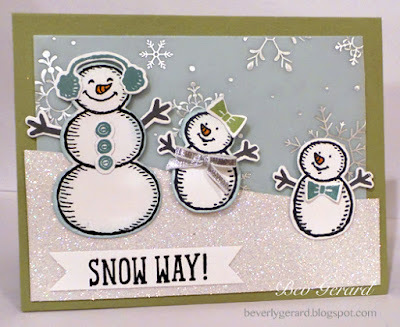 I was taken with Brian’s sketch, then I pulled out the same stamp set, flipped the sketch and chose snowmen rather than penguins … The darling “Snow Place” stamp set has been begging to play here, and this was the perfect way to let it loose on the stampin’ table! 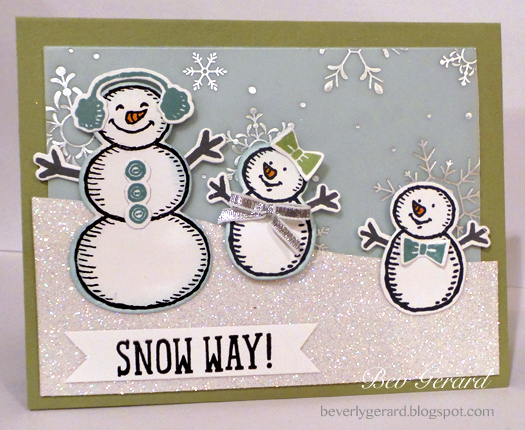 I created a happy snow-people family coming out to play in their early, unexpected snow! And since I can barely stamp without using Stampin’ Dimensionals, the playday needed dimension! Note: I’ve looked ‘n looked for a pic from July’s convention to share here … but currently, that flash drive is MIA. If it peeks out from it’s amazing hiding spot, I’ll update. LOL Letting it go for now ‘n moooooooving on … there are Thanksgiving preparations to get started here! Thanks ever so much for your online orders! 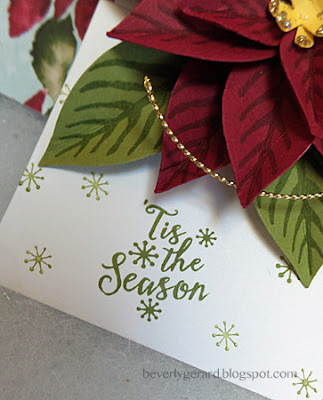 Remember that if you use the current Host Code CATXACAJ with your $30+ order right now, you’ll be entered into my drawing for a stamp set from the upcoming Occasions 2016 Catalog! This includes orders from the Online Extravaganza (sale ends Nov. 30 … so hurry)! This month Kelly Schirmer has challenged us to create a tag to coordinate with a gift wrap! Well, that’s definitely going to be on everyone’s to-do list soon enough … so the timing seems positively perfect to me! Thanks, Kelly! 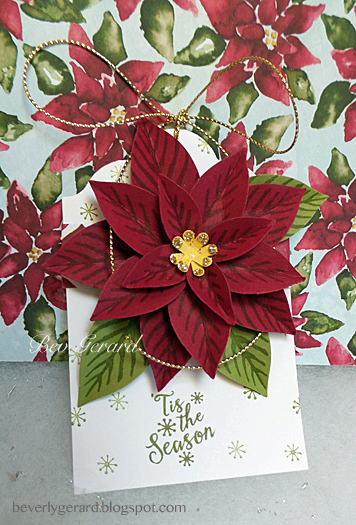 Poinsettia fans, I hope you like it! You’re invited to visit my fabby + talented Challenge Chicks colleagues for even more inspiring ideas! We love for you to join in the challenge with us, too. Just link your creations back to our Facebook page, and use the challenge keyword, CHXNOV15, in your gallery uploads on your favorite sites for sharing. You’re always welcome to contact me with questions or ideas. If you’re interested in joining the Stampin’ Up! family, there’s an empty spot here waiting just for “you”! Check out this link if you’d like to stamp with Lydia Fiedler, me, and lots more stampy friends in Dallas! You’re invited – but the sign ups close tomorrow, Tuesday, Nov. 10, so hop on quickly! We hope to stamp with you on Friday! Nope! Not naming any names for this one … but … you know who you are! Or surely you know someone coming up on an “umpteenth” … i.e. who’s counting anyway birthday! Quick post today … I’ve spent most of my awake time over the past 20 hours in search of an elusive “S” die from my Little Letters Thinlits set. Sweet downline + sideline peeps have given me some great search ideas, including searching with a huge magnet … which I’ve done. Still, I’m losing this episode of Hide & Seek. But it isn’t over until I say it’s over …To be continued! I totally love the rich colors of the Bohemian designer series papers … and this bitty pattern is one of my faves from the collection. It reminds me just a little of the Native American head dresses I used to see at Pow Wow’s in NW Oklahoma … rich, earthy colors. 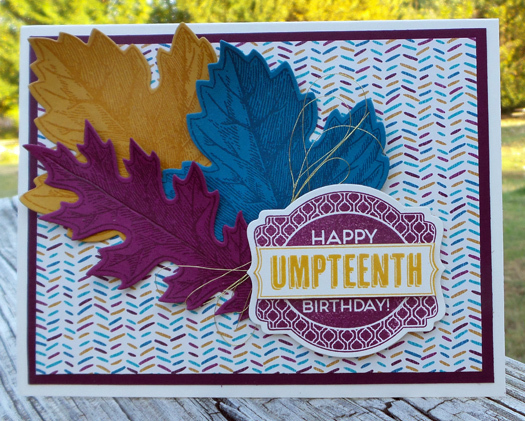 The Vintage Leaves are so so easy to stamp then die cut with the coordinating Leaflets set. And, to create the sentiment, I just stamped it once with Rich Razzleberry ink, then again with Crushed Curry ink and cut out the “Umpteenth” banner and adhered it atop the R. Razzleberry badge with Dimensionals. 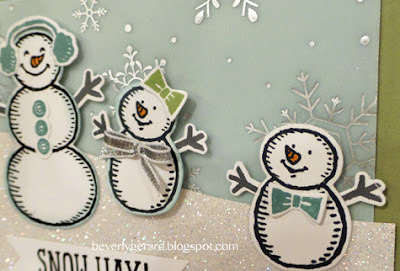 The Deco Labels framelits are perfect for the Oh My Goodies stamps. That teeny bit of gold behind the sentiment badge? That’s the Gold Metallic Thread found in the full-sized catalog. on Friday, November 13th! You’re invited! Time is almost over for registrations, as we need to get started on prepping our materials kits, so please grab up your seat today while they’re available. Check it out + stamp with us! Last Call to Save 15% on Stamps! Save 15% on Stamps in Your New Kit, too! Did you know that you can choose the stamps for your starter kit at 15% off and still receive the additional discount of $125 worth of discounted stamps for only $99? That’s just like a 15% add-on to your kit! Then you’ll enjoy your very own 20% discount indefinitely, good through March, 2016 if you never place another other … and never make a sale. Your discount lasts on ‘n’ on if you do make sales and/or purchases. 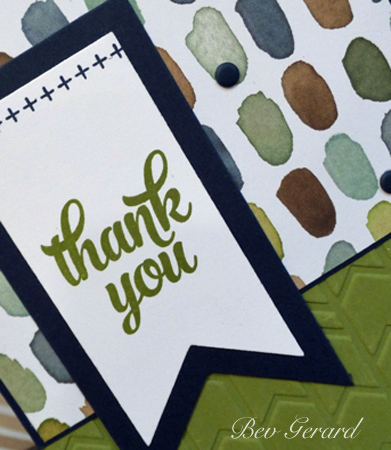 Whether you choose to save big on the starter kit or just save on your favorite ‘Wish List’ of stamps, I’ve come with a Thank You card for you today! Old Olive, anyone? 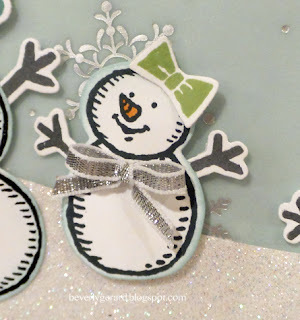 If you enjoy keeping a stash of cards ready to go when needs arise, you’ll enjoy creating a few of these … maybe in varied colors for a few choices. The sentiment and +++++ decorative line are both from the Tin of Cards stamp set shown on page 110 in the main catalog. Yes, it coordinates with the Tin of Cards project kit, but it stands alone as a very versatile stamp set for sure. Did you think the English Garden designer series paper is just for Spring? Not! That’s the beauty of this double-sided 12″x12″ collection … it spreads much farther across the calendar. Blooms may have shriveled during the Summer, but earthy colors are still in style! 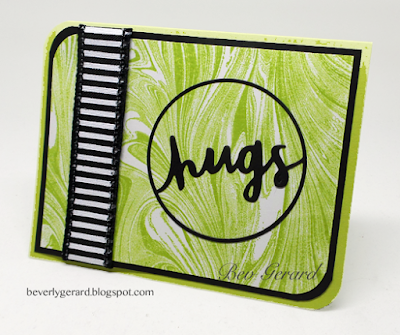 I’ve used it with Old Olive and Night of Navy card stocks, with a helping of texture from the Arrows Textured Impressions embossing folder. A trio of Candy Dots finish it off for “no extra postage” mailing ease. > > > One last topic for today! If you’d like to join us for a stampin’ date in Dallas on November 13th, please do consider joining us from 10:00 a.m. until 3:00 p.m. for fun, stamping, prizes, fellowship, and plenty of inspiration for all! Dallas UNWIND Mini Retreat! Check it out here! The thanks goes to “you”, my customers! I appreciate your business, I adore your presence in classes, and I’m happy to assist you in any way that I can. skin …. ‘cuz the skin on my fingers is totally pink now!! 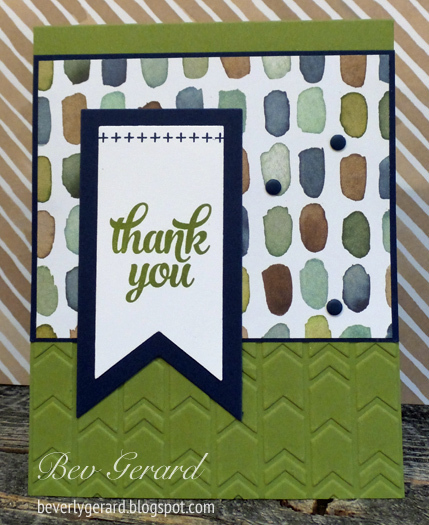 I love this sentiment from the ‘Bravo’ stamp set! It brings a message to cancer patients who have just endured a dreaded procedure, just made it through another round of chemo, just faced a needle again that scares them or hurts like crazy, just got out of bed to face another day … … the possibilities go on and on. A fabby shimmer is visible in person with this card, but it was pretty elusive to the camera today, even in natural light. A teeny bit is showing in the sentiment closeup. Shimmery White card stock is one of my all-time fave card stocks … and the shimmer is unbeatable. Much more understated than glitter, but so smooth and yummy for the eyes. Try it out in your next order … you can’t help but adore the look and feel. Plus, it is lovely with inking techniques and coloring atop … the shimmer comes right through! The inking technique is from my trusty SU Spritzer and Color Burst Powders. Loved this spritz technique from retreat, and just “had” to use it for this challenge! 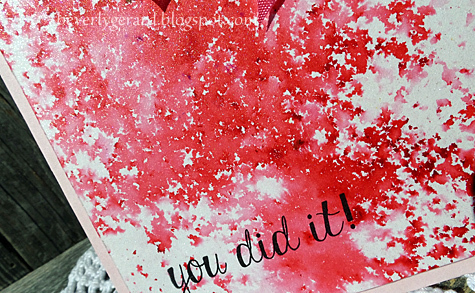 I’ll include a complete list of Stampin’ Up! products below with quick links for your shopping convenience. Thank you so very much for choosing me as your Stampin’ Up! demonstrator! And guess what! If you order this stamp set between October 19 – 23 … stamps are 15% off! **If you have a wish list that’s overflowing … please consider joining my team! 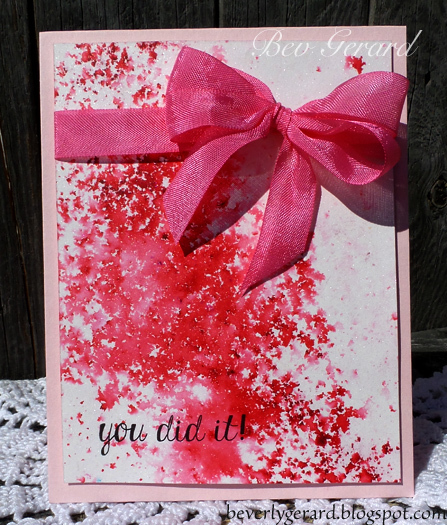 I welcome happy discount shoppers as well as “dye-hard” stampers alike! Call me, email me … ask bunches of questions … I’m tickled to answer any time. Annnnnd …. if you’re thinking about visiting Texas in November … or if you’re already here … please join me and Lydia Fiedler in a stampin’ day at the Hyatt Regency – Dallas on Friday, November 13! Click right here for the scoop and to secure your seat with your RSVP today!